BOC Chairman Melvin Davis, who votes only in the case of a tie among the other four members, made it clear he wants the vote to be in May, as did Commissioner Mark Saxon. Commissioners John Daniell, Margaret Hale and Jim Luke said they do not. Hale had indicated at last week’s meeting that she wanted a postponement of the vote, but no one had spoken up to support her. The Commissioners agreed tonight that the agenda for next Tuesday night’s meeting should include an initial vote on when the Commissioners want the tax issue on the ballot. Originally, it was to include a vote on the final ballot language for a May 20 referendum on the tax issue. Before the Commissioners took up the SPLOST item on tonight’s agenda, Chairman Davis invited Oconee County Chief Superior Court Judge David Sweat to speak. Sweat said that he now recognizes the difficulty the Commissioners would have in providing the $25 million he had requested for a new courthouse or judicial facility, given the needs of the county reflected in the other $75 million in requests made by elected leaders, county department heads and citizens. He proposed that the county consider as one alternative spending $10 to $15 million to renovate the existing courthouse, making it entirely a judicial facility. The other offices now in the courthouse would have to be located elsewhere to provide the security he said is needed as well as the space for judicial expansion. A second alternative is to spend $4 to $8 million to renovate a little more than half of the existing courthouse building and the old jail to accommodate judicial needs. These were temporary fixes, Judge Sweat said, with the first alternative working for from nine to 12 years and the second for five to seven years. The original plan was for to provide needed judicial facilities for 20 plus years. Davis told the Commissioners he recognized that the final decision on SPLOST funds would be made by the group collectively, but he wanted to offer first his proposal. He began by saying that he would spend $2.7 million of the unspent $3.7 million from SPLOST 2004 for the courthouse or toward a replacement facility and $1 million for the libraries. In SPLOST 2015, Davis said he would give Law Enforcement $5 million of the $5.5 million it requested and give Fire Rescue $3 million of the requested $5 million. Davis would give Public Works all of the $12 million it asked for from the upcoming SPLOST for county roads, and he would give the Utility Department $9.5 million of the $13 million it requested. Davis proposed cutting the request of Animal Control from $500,000 to $320,000, and not funding the request of the Coroner for a transport vehicle from SPLOST, but turning to the general budget for that purpose. Davis would set aside $1 million for county facility repair, rather than the requested $2 million. The library would get only $1 million from the 2015 SPLOST, rather than the requested $5.5 million. Parks and Recreation would get $8 million, rather than the requested $10 million. He would set aside $2.5 million for Civic Center improvements, rather than the requested $12 million. Davis cut the proposal of the Industrial Development from $4.7 million to $2.5 million, eliminated the $2 million request for a Georgia State Patrol Post, and cut the $2 million request for farmland protection to $500,000. Davis left in the requested $500,000 for historic preservation. Davis left in a request by the courts for $475,000 for new technology. He cut the request for $25 million for a new courthouse to $1 million. His new total is $47.3 million, down from the $100 million requested. The $47 million is consistent with the revenue projections the county is using for the six-year SPLOST 2015. The tax is 1 percent of purchases. The county usually budgets at 80 percent of requests, meaning the actual total that could be spent would be about $38 million–until the end of SPLOST and there was certainty that revenue matched projections. 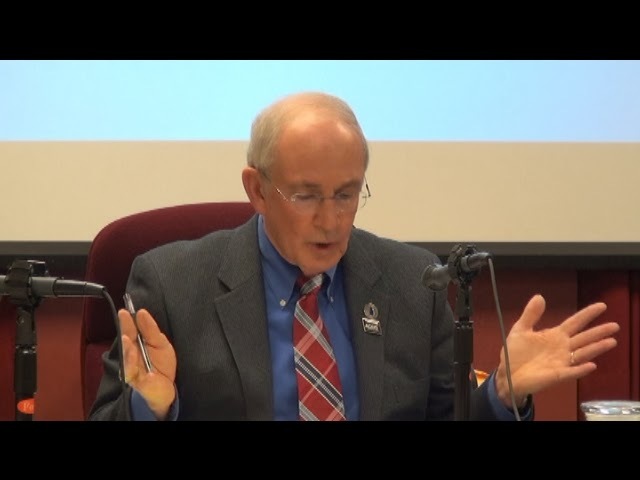 Commissioner Luke spoke when Davis was finished presenting the revised list. Luke said he was not ready to engage in a discussion of the changes just proposed. Commissioners Hale and Daniell said they, too, felt things were moving too quickly. The SPLOST originally was to be on the ballot in July, but that election date was moved forward in response to a federal law suit. The current SPLOST does not expire until the end of 2015. Background on the SPLOST requests is in a story I posted last night. Links in that posting provide more detail. Not one penny, not one penny for the Industrial Development Authority. I hope the 3 commissioners stand their ground. There is little reason to rush this through when it does not start for a over a year and a half.